USC features four players on its poster series. Receiver Marqise Lee's limited edition poster, above, has his signature reproduced in gold foil. 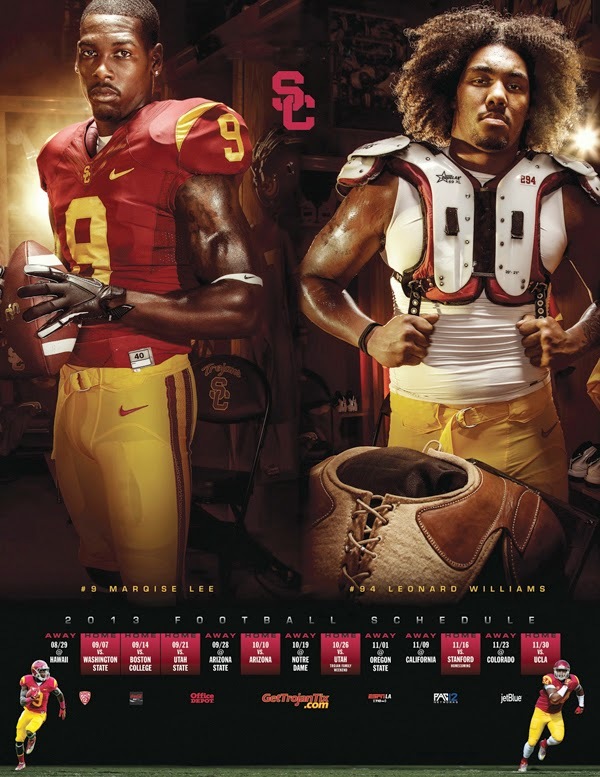 Lee and defensive end Leonard Williams are featured in the image below, followed Lee and linebacker Hayes Pullard and Lee and defensive tackle George Uko. The posters were developed by Craig Kelley and the photographer was Cameron Cone. Design and photo manipulation by Perceptiv. A heartbreaking week for UCLA. Walk-on receiver Nick Pasquale died from blunt-force injuries sustained after he was struck by a vehicle early Sunday. "This is a tragic loss," coach Jim Mora said. The Bruins will honor their fallen teammate by wearing No. 36 emblems on their jerseys during Saturday's game at Nebraska. Brutal opening month for the Georgia Bulldogs, who already have played Clemson and South Carolina and have a date with Louisiana State on Sept. 28. After that, the schedule lightens up with the biggest hurdle being Florida on Nov. 2. New Mexico boasts the nation's leading rusher in Kasey Carrier after Saturday's 42-35 overtime victory at Texas El Paso. Carrier ran for 291 yards and four touchdowns and has 345 yards in two games. That's 19 more than Jamaal Williams of Brigham Young. Next up for Bob Davie's Lobos is a trip to Pittsburgh.